At the Google I/O, Android O was announced, and the new Android OS was then officially released on the day of Solar Eclipse, i.e., August 21st. Now it’s time for the new hardware stuff from Google. On October 4th, the company launched the Google Pixel 2 and Pixel 2 XL which are the successors to last year’s Pixel and Pixel XL. In this article, we are going to talk about the specifications and the pricing of both the phones. Let us know in the comments section if you liked the phones or not. So, starting off with the smaller of the two, the Pixel 2 looks like a normal 2016-ish device with those wide bezels all over the front. To cope with the bottom bezel, Google has added a front-firing speaker on the bottom chin so, there are stereo speakers on the Pixel 2. It has a 5-inch 1080p Full-HD AMOLED Display which makes it a compact device with the normal 16:9 aspect ratio. 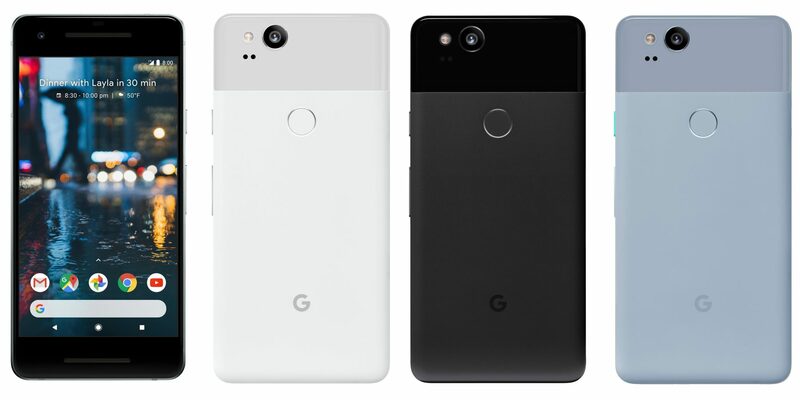 Rest of the specifications remain the same for the Pixel 2 as well as the Google Pixel 2 XL that includes Snapdragon 835, 4GB RAM, 64/128GB Storage and 12MP rear camera. And yes, there is no headphone jack on either of the two Pixel phones. Android Oreo runs out of the box. Unlike last year’s Pixel phones, the Pixel 2 is IP67 dust & water resistant. The battery size might be a concern as the phone features only 2,700mAh battery. We hope to see some serious software optimization by the company. Lastly, just like the HTC U11, the Pixel 2 has the ‘Active Edge’ feature to let users do various things by squeezing the phone. If you are looking for a phone with 2017-ish design elements, then the Pixel 2 XL is that device. The phone features a 6-inch Quad-HD+ pOLED display with minimal bezels and 80-85% screen-to-body ratio. Under the hood, it is powered by a Snapdragon 835 chipset, has 4GB RAM and 64/128GB ROM. The battery size has increased from 2,700mAh on Google Pixel 2 to 3,520mAh on the Google Pixel 2 XL. There is also an E-SIM card slot that means users can use different networks without having to replace the SIM card. This is the same feature as in the latest Apple Watch Series 3. Just like the Pixel 2, the Google Pixel 2 XL is IP67 Dust and Water Resistant. There is also the same ‘Active Edge’ feature on the Pixel 2 XL. Now coming to the pricing, the Pixel 2 is priced at $649 for 64GB model whereas $749 for the 128GB model. As for the Pixel 2 XL, the price for the 64GB model is $849 and $949 for the 128GB variant. Well, Google Pixel device are known for their ultra fluid UI and superb cameras. With the Pixel 2 and Google Pixel 2 XL, we are hoping the same. It is sad that we have to say Goodbye to the beloved 3.5mm headphone jack. Google also offers unlimited cloud storage for the users of the Pixel 2 and Pixel 2 XL up to 2023 which is incredible. What are your views on the specifications of the Google Pixel 2 and Pixel 2 XL? Do let us know via The comments section. No head phone jack is a deal breaker for me. I will just keep my LG V20, not only does it have a headphone jack, but it has connected a high end D/A Converter to it, to really guarantee quality sound. No Bluetooth headset can give you that because of the limited frequency broadcasting Bluetooth has. The internal battery is easily replaceable alongside the internal memory, I have a 256 GB card in mine. To sweeten the deal the phone is priced down recently.